Food protein-induced enterocolitis syndrome (FPIES) typically affects infants and young children and causes symptoms of vomiting and bloody diarrhea that leads to dehydration and shock after the consumption of certain foods. When symptoms are chronic, FPIES can lead to weight loss and lack of appropriate growth. FPIES is caused by an immune reaction due to common foods and is not caused by a true allergic reaction. FPIES may be confused with food allergies since the reaction occurs after the consumption of certain foods; however, since most children with FPIES do not make allergic antibodies against the trigger food, allergy tests are not useful. Symptoms of FPIES most often occur within a few hours of eating the trigger food. Repeated episodes of severe vomiting start within three hours after eating the causative food, and diarrhea within five hours. The child quickly gets dehydrated, may have low blood pressure and is lethargic. 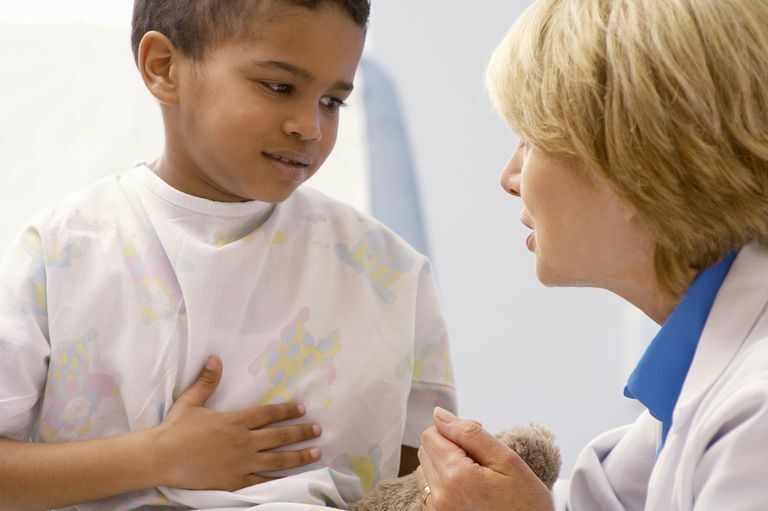 The child often requires emergency room care, and it is common for the child to be diagnosed with sepsis. While FPIES can mimic food allergies, symptoms typically consist only of gastrointestinal symptoms, with other organ systems unaffected. For example, severe food allergies commonly result in symptoms of hives and swelling of the face and may cause respiratory symptoms such as coughing or wheezing. These allergic symptoms also occur much more quickly than those symptoms seen in FPIES -- most often within a few minutes of eating the trigger food, rather than hours. There are a variety of foods that have been reported to cause FPIES -- most commonly reported include milk and soy-based infant formulas. Many infants with FPIES will react to both milk and soy. Reactions to infant formulas usually occur before 1 year of age, often within a few weeks of introducing the formula. FPIES has also been reported to occur with solid foods, especially cereal grains, legumes, and poultry. Other foods reported to cause FPIES include sweet and white potato, various fruits, fish, and shellfish. The most common solid food to cause FPIES is rice cereal, although many other cereal grains have also been reported. Children with FPIES to one cereal grain have a 50% chance of developing FPIES to another cereal grain. Eggs only rarely cause FPIES. It is rare for a child over the age of 1 to develop new-onset FPIES to a newly introduced food; the exception is for fish and shellfish, which have been known to cause FPIES even in older children and adults. Therefore, the diagnosis of FPIES is usually made on a clinical basis since there is no diagnostic test available to confirm the diagnosis, short of performing an oral food challenge, which is not usually necessary. Some researchers have found that patch testing to foods may be useful to confirm the diagnosis and possibly be helpful to determine when a child has outgrown FPIES. Avoidance of the trigger foods, as well as avoidance of other foods known to commonly cause FPIES, is the mainstay of treatment. If the child has FPIES caused by a cow’s milk-based infant formula, soy formula should also be avoided, given that a child will experience symptoms to both foods about 50% of the time. If possible, exclusive breastfeeding is recommended and should resolve the problem. If infant formulas are used, the extensively hydrolyzed formulas (such as Alimentum and Nutramigen, in which the milk protein is broken down into small pieces) are the formulas of choice for infants with FPIES. Avoidance of cereal grains, poultry and legumes are also recommended. Most fruits and vegetables are not frequently a problem and are typically tolerated in children with FPIES. Once symptoms do occur, treatment should be sought in an emergency room, given the severity of the symptoms. Intravenous fluids and corticosteroids are often required for the acute treatment of FPIES symptoms. Injectable epinephrine is frequently given although it has very little benefit for the treatment of FPIES. At What Age Does FPIES Resolve? Typically, FPIES resolves by age 3, meaning that the child is likely to be able to tolerate the culprit foods after this age. However, parents should not attempt to determine if the child can tolerate the food at home. Rather, an allergist may choose to perform an oral food challenge under close medical supervision, such as in the doctor’s office or in the hospital. It is recommended that these oral food challenges be performed with an intravenous catheter in place so that intravenous fluids and corticosteroids can be administered if needed. Leonard SA, Nowak-Wegrzyn A. Food Protein-Induced Enterocolitis Syndrome: An Update on Natural History and Review of Management. Ann Allergy Asthma Immunol. 2011;107:95-101.